Apple on Wednesday unveiled iLife ’11 at its Back to the Mac event in Cupertino, demoing three of the suite’s updated applications—iPhoto, iMovie, and Garageband. Features showcased included a new, iOS-like full-screen mode for iPhoto, redone audio editing and trailer templates in iMovie, in addition to revamped recording and teaching tools for GarageBand. The updated suite was released Wednesday and will cost $49. It will also come preinstalled on all new Macs. In a lengthy demo that consumed nearly half of Wednesday's press event, Apple CEO Steve Jobs was joined by Senior Vice President Phil Schiller, Randy Ubillos, chief architect for the company's video applications, and Xander Soren, GarageBand's product marketing manager, who each took one of the suite's flagship programs to demonstrate. First up was Phil Schiller—describing iPhoto ’11 as “the best version yet”—who started his presentation by showcasing the program’s newly redesigned full-screen mode. Taking a few design cues from the iPad, iPhoto’s full-screen mode features a row of tabs along the bottom of the screen for Events, Faces, Places, Albums and Projects. Faces and Places look similar to their iPad counterparts, while Albums adds the ability to pull read-only photos from both Facebook and Flickr accounts. Projects now displays user-created items like books and cards on a wooden shelf. New slideshow templates offer auto-generated transitions, labels, and background music; Schiller previewed several themes, including one called Places—similar to iMovie ’09’s Maps—as well as a Reflections and Holiday theme. Photo sharing, too, has been simplified. “Share via Email” allows users to select a group of photos, click the option, and have iPhoto automatically create a postcard within the program. 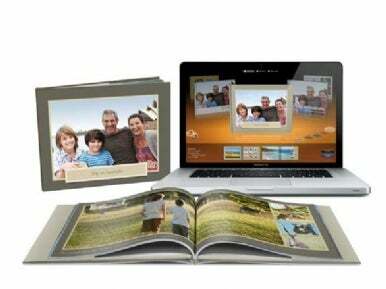 Choose from several different templates; drag, drop, and resize photos within; and choose whether to attach the full-resolution photos or just the postcard. A new sharing panel links Flickr and Facebook accounts and shows the user’s sharing history. Book creation, meanwhile, has undergone a complete carousel-inspired redesign. Users can pick an album, click Create, select Book, and are brought into the new full-screen book creation view. Choose a type of book, and iPhoto will auto-fill photos, using information about the album selected to create the pages—for instance, the album’s key photos is translated to the book’s cover, and higher-rated photographs are automatically assigned to larger spreads. If you want to customize your book, however, it’s easily doable: users can change the picture layout as well as individual pictures, drag and drop pages to reorganize them, and alter the page background. With iPhoto ’11, users can also create and order letterpress cards in addition to the flat and folded options previously available in earlier versions of the program. The Cards creator features an introductory video on letterpress techniques for new and interested users. If you polled iMovie ’09 users and asked them to name their biggest complaint about the software, there’s a good chance it would involve audio editing. Apple, it seems, has listened to these complaints. When introducing the program, Steve Jobs noted that it was “the number one request we got after the last version of iMovie,” and as such, the first fix to be showcased on stage by Apple engineer Randy Ubillos. Audio waveforms—color-coded to show peaked levels—now appear under video clips in both iMovie's Project and Event views, and can be easily adjusted by dragging the volume slider along the clip. To change a section of a clip, highlight it, then drag. Users can also adjust fade-in and fade-out on each side of a clip. Audio can be altered, too, using effects rendered in real-time—in the demonstration, Ubillos used a pitch-change effect on a child reciting a line from The Empire Strikes Back to make him sound like Darth Vader. In addition, though not specifically highlighted in the demonstration, iMovie ’11 features Single Row View—known to most people familiar with non-linear editing programs as “timeline view”—which translates your project into one horizontal side-scrolling row for easier editing access. 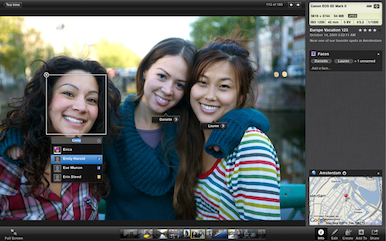 iPhoto’s Faces feature has also found its way somewhat into iMovie ’11, thanks to a feature called People Finder. It analyzes clips and organizes them by the number of people in a scene, specific faces, and whether the clip is a Group, Closeup, Medium, or Wide shot. 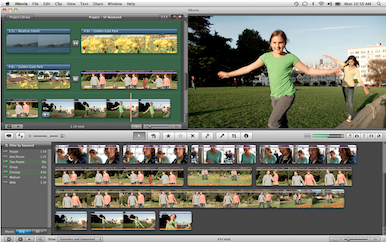 Building upon iMovie ’09’s initial effects pane, iMovie ’11 adds “one step effects”—real-time video and audio alterations to your clips. Demonstrated at the event were Instant Replay and Flash and Hold; Apple’s Website also features an effect called Jump Cut at Beats, which matches background with your audio and performs an automatic jump cut at the appropriate time. Also built into the program: Movie Trailers, allowing users to pick from one of 15 template themes—among them adventure, drama, and romantic comedy—to create instant previews. Each theme even comes with an original score recorded by the London Symphony Orchestra. In addition to trailers, there are several new sports and news themes to add to a project’s transitions and titles. All iMovie projects can be directly exported in HD to Facebook, Vimeo, CNN iReport, and any iOS device—including the Apple TV. The final program to get an on-stage demo Wednesday was GarageBand, shown off by Xander Soren, product marketing manager. Soren focused on GarageBand’s new recording and instrument tools, including new Flex Time, Groove Matching, and “How did I play?" features, more guitar amps and effects, and new piano and guitar lessons. Although not mentioned directly in Wednesday's presentation, Jobs did note in his initial speech that iLife '11 would feature the same programs as its predecessor, and both iWeb and iDVD are listed on Apple's iLife Website—though it's not clear what, if anything, has changed for these programs since iLife '09. Macworld has put in a request to Apple for further comment on whether iWeb and iDVD contain new features in the updated suite. iLife '11 is available for purchase from Apple's Website and retail stores for $49 and requires a Mac running OS X 10.6.3 or later. Full system specs and other requirements are available via a Knowledge Base article on Apple's Support page. Updated at 12:45 p.m. PT to add details on iPhoto, iDVD, iWeb. Updated at 2:20 p.m. PT to add details on system requirements. Updated at 5:24 p.m. PT to add details on iMovie.